BeatCoin is not a new hacking technique; instead, it’s an experiment wherein the researcher demonstrates how all previously discovered out-of-band communication methods can be used to steal private keys for a cryptocurrency wallet installed on cold storage, preferably an air-gapped computer or Raspberry Pi. For those unaware, keeping your cryptocurrency protected in a wallet on a device which is entirely offline is called cold storage. Since online digital wallets carry different security risks, some people prefer keeping their private keys offline. Air-gapped computers are those that are isolated from the Internet, local networks, Bluetooth and therefore, are believed to be the most secure devices and are difficult to infiltrate or exfiltrate. If you are new to this topic, we recommend reading our previous articles, detailing how highly-motivated attackers can use specially designed malware to exfiltrate data from an air-gapped computer via light, sound, heat, electromagnetic, magnetic, infrared, and ultrasonic waves. 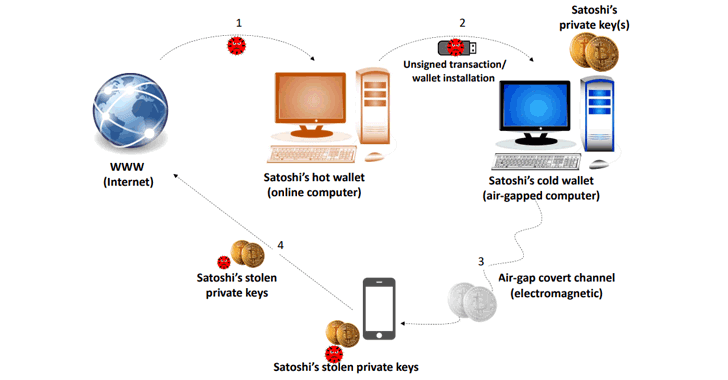 For BeatCoin experiment, Dr. Guri deployed malware on an air-gapped computer that runs a Bitcoin wallet application and then performed each attack vector one-by-one to transmit the wallet keys to a nearby device over covert channels. 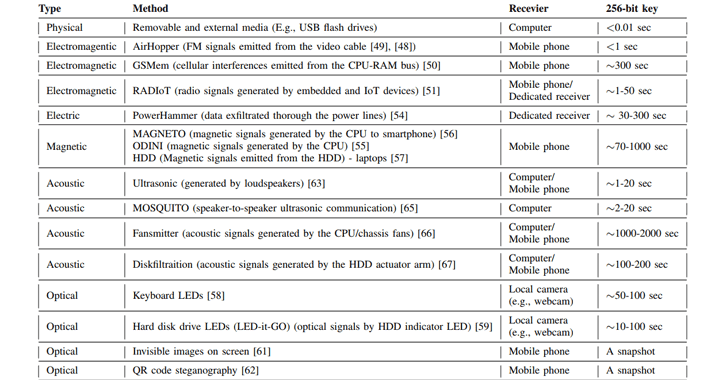 Results shown in the above chart suggests AirHopper, MOSQUITO, and Ultrasonic techniques are the fastest way to transmit a 256-bit private key to a remote receiver, whereas, Diskfiltration and Fansmitter methods take minutes. Guri has also shared two videos. The first one demonstrates exfiltration of private keys from an air-gapped computer, which hardly took a few seconds to transmit data to a nearby smartphone using ultrasonic waves. In the second video, the researcher transmitted private keys stored on a Raspberry Pi device to the nearby smartphone using the RadIoT attack—a technique to exfiltrate data from air-gapped internet-of-things (IoT) and embedded devices via radio signals. In the last research published earlier this month, Guri’s team also demonstrated how hackers could use power fluctuations in the current flow “propagated through the power lines” to covertly exfiltrate highly sensitive data out of an air gapped-computer.